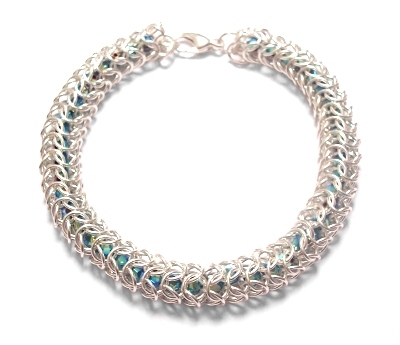 This bracelet was started in European 4-in-1 and as I was making and playing around with it I realised I could zip it up along one edge to turn it into Round Maille. I duly did this but them thought it was too bland and silver. So I unzipped it and experimented with putting beads into the small spaces available in the chain. Fortunately I discovered that a 6mm Swarovski double AB crystal fitted perfectly. The crystals give this piece an incredible, colourful, sparkly effect.